Indignation aplenty on this date, May 2, in 1929 as The Chicago Tribune railed against the sand companies of the city and the boats they employed to ship sand for concrete into the city, the result of an accident two days earlier that saw the 251-foot-long sandboat Sandmaster smashing the heck out of the Clark Street bridge. In 1929 a large number of river bridges still sat on turntables that were located in the middle of the river. When boats approached, the bridges were swung so that they paralleled the shore, leaving close quarters for ships that had to pass on either side of the opened bridge on a very busy river. 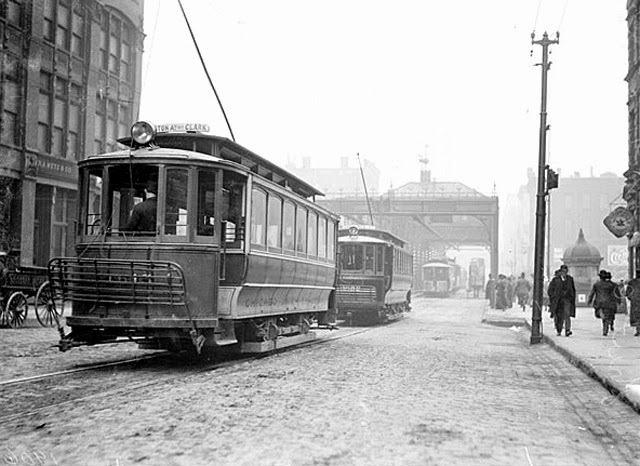 All Clark Street traffic, including a major north-south trolley car line, had to be rerouted after the accident. If there was any positive to the situation, a new Clark Street bascule bridge had been started, and it had been the hope that the old bridge could be kept going until the new bridge was finished sometime later in the year. That was not to be. It was a mess, especially for the first couple of days when almost nothing could move up or down the main stem of the river. On the same day that the editorial ran, the Sandmaster was freed from the wreckage of the bridge while the city council went to work. Alderman William A. Rowan introduced a resolution to mandate fixed bridges on the river. The Commissioner of Public Works was also ordered to pursue, pending a completion of his investigation, court action against the Materials Construction Company, the owner of the boat, as a result of the $50,000 worth of damage to the bridge and the blockage of the Clark Street entrance to the Loop. The Fullerton Avenue and the Diversey Boulevard spans were particularly unlucky. The ship had rammed the former bridge 18 times and the latter 13 times. The investigation also revealed that another six inches would have thrown the Clark Street Bridge, along with the six pedestrians standing on its turntable, into the river. On the following day, May 10, the president of the Construction Materials company, J. R. Sensibar, responded to all of the criticism. “The injuries to bridges were, in the main, trifling damages to wooden planks and ladders,” he said. “They were caused by the carelessness of the city, not the carelessness of the boat’s captain. The Sandmaster has made 1,300 trips on the river. The only two serious accidents were those at the Cortland Street bridge in January, 1927, and present damage to the Clark street bridge.” [Chicago Tribune, May 10, 1929]. On May 12 Mr. Sensibar (I love the name – a cross between “sense” and “sand bar”) went into more detail, more lucid and far more illustrative of his legitimate cause for outrage at the fingers that were being pointed in his direction. 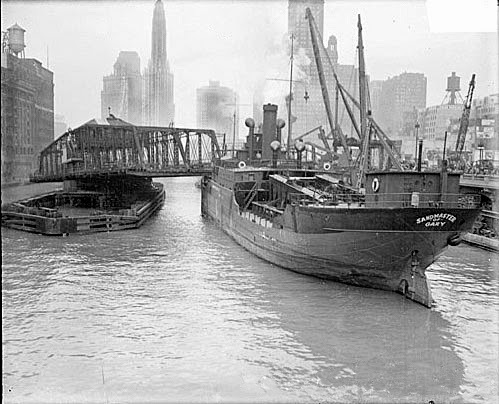 Originally, the United States government had dredged the river to a depth of 22 feet, but when the Chicago Sanitary District took over the operation, things gradually changed. Over time the sewage that was dumped into the river had decreased its depth to 14 feet. “It would be a saving of money to the city in the long run to restore the river to its proper depth and turn it back to the government,” Mr. Sensibar concluded. In an amazing display of engineering the new trunnion bascule bridge at Clark Street was opened in a formal dedication ceremony on July 10 of that same year. The river kept on flowing, the bridge started going up and down, and all was well . . . for awhile. A lot of oversimplification takes place today about the Chicago River – not surprising since it has never looked as good as it does right now. A lot of folks assume that the river was reversed in 1900, and everything was right and just. But the love-hate relationship with the river continued through much of the twentieth century as cars, buses, elevated trains, and pedestrians were delayed by random bridge raisings and those who made their livelihood on the river cursed a city that had grown because of their efforts and yet always seemed ready to make things as difficult for them as it could. And boats continued to crash into bridges and into each other.